Setup Welcome dialog / Click on "Next"
With the this option, an optimized distribution set of components for productive use will be installed. The set contains the Portal Server, Portal Manager, search server and various database drivers. With the this option, an optimized distribution set of components for cloud or cluster use. The set contains the Portal Server, Portal Manager, cloud components, search server and various database drivers. With this option, a reduced distribution set optimized for you platform is installed. The set contains the Portal Server, Portal Manager, search server and the most important database drivers. With this option, only the Portal Manager will be installed. 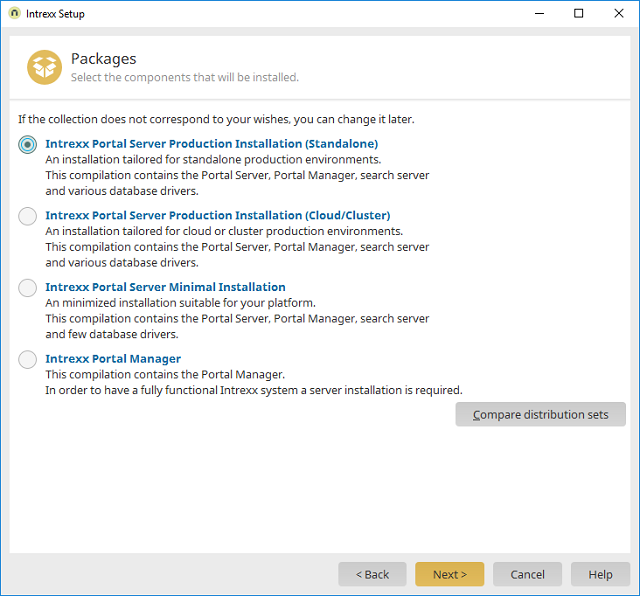 Select this type of installation if you want to connect to an Intrexx Portal Server from a client, in order to create new portals there or to edit existing portals. Click on this button to open a dialog which will provide you with information about the components included in each installation option. Goes back to the previous setup dialog. Continues to the next setup dialog. Before clicking on "Next", please close all running programs.